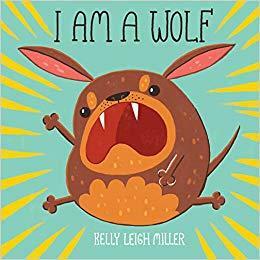 "This readaloud is sweet and silly, switching between digitally drawn images of Wolf, a cute, spherical blob with long ears and twig legs, bouncing with excitement or looking so sad that her chin wobbles; Wolf’s goofy grin on the last page will be contagious to kids and adult readers-aloud... Kids with a weak spot for off-the-wall pets will get a kick out of this one." "Working digitally, newcomer Miller creates her cartoon characters with emphatic swatches of matte color against generous white space. Lovable." "Debut creator Miller’s boldly expressive cartoons show the varying temperaments of dogs and humans. Even the lone wolves of the world, her friendly story suggests, need love."